If you’re an iPhone user than you better check for some important updates that will be able to fix an unknown security issue that all the devices of Apple had till now. According to a security note by Apple the old version of Apple iOS was missing SSL authentication because of some fault and to cover that up Apple have come up with some patches for old iPhone 3GS and all the new version of smartphones as well. 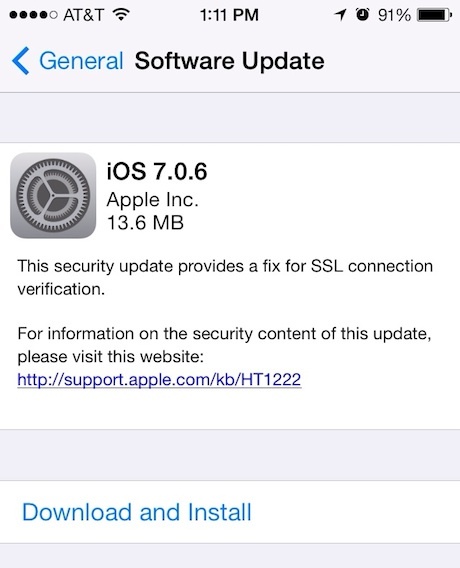 There are two patches updates including 7.0.6 and 6.1.6 for iPhone 3GS. The faulty SSL authentication was making the phone vulnerable and any hacker with access to the Wi-Fi to which a person’s iPhone is connected to, it could check on personal and important information like messages and emails. Till now only Apple’s Cupertino firm knew about this issue with the iPhone and now everyone knows about it, but the company have issued an update before that. Cupertino based firm did not let us on any information if any hacker have taken advantage of this problem found on the iPhone but now with the new patch iPhone will be secured. Apple is asking you to use Wi-Fi to download this new patch as they range from 16MB to 35MB deepening on the patch version you are getting so better start checking for updates right now and be safe. According to some researchers the OSX operating system from Apple is also facing the same faulty SSL authentication issue which means that both the platforms were having this issue and if this was true then we might also see an update from Apple for their OSX operating system. Because of the faulty SSL authentication issue a hacker can appear as a protected site and go through all the important data of that person through protected sites which for some people might be the worst nightmare as everything nowadays is dealt through emails and some hacker having the power to look into these mails can cause some serious damage.